With the valuable assistance of skilled team of professionals, we are engaged in offering an extensive array of Coconut Oil Bottles. The offered array is manufactured with the help of quality raw materials and modern techniques. These bottles are designed for storing coconut oil. These bottles are attached with fixed seal cap. These oil bottles are very elegant in design and crack resistant. Tested against many quality standards, this gamut is kept in compliance to set global norms. Minimum Order Requirement: 3000 to 5000 Pcs. 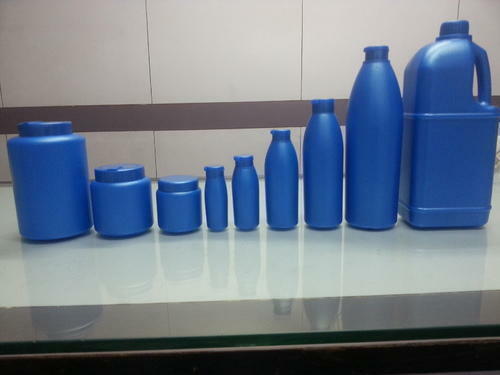 We, JAI PLAST, established in the year 1994, are a reputed Manufacturer, Supplier, Exporter of Plastic Blow Moulded Articles such as Plastic Bottles, Plastic Jars & Cans, HDPE Plastic Bottles, Coconut oil bottles, Paint Stainer Bottles, Agro & Pesticide Bottles, Chemical bottles, Hand wash bottles, Toilet cleaner bottles etc. We are one of the most recognize names in the plastic packaging industry. Our growing popularity is backed by our high quality products as well as a concerted approach to customer satisfaction. The above plastic bottles are exceedingly demanded these days for numerous applications in Indian market to store edible coconut oil, hair oil, paint stainer, chemicals etc. We strongly believe that Storing liquids is not the only intention, but to keep it leak proof, hence clean and it must look pleasing to the eye too which is our foremost motive. Owing to our qualitative products, ethical business policies and client-centric approach, we have been able to build a wide customer base across the globe, especially in Indian Subcontinent.